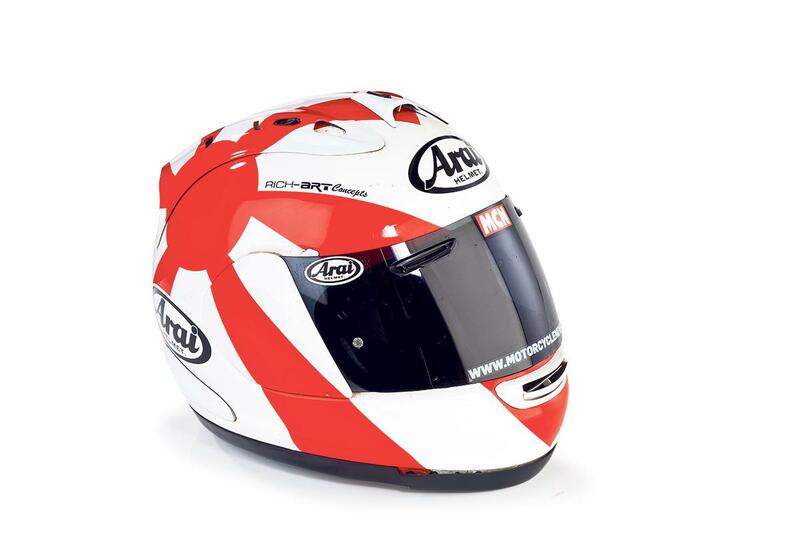 ﻿ Arai RX-7 GP: "It kept me safe when I highsided"
What’s good: I have been wearing Arai helmets for 20 years. This RX-7 GP is now five years old and has been used for road-test work and racing. It has kept me safe and shared some of the most unforgettable biking experiences I’ve had: racing at the NW200; doing 207mph on theV10-powered Millyard Viper; and accelerating to 180mph in 13 seconds on the Kawasaki H2R. After all that, it finally fulfilled its reason for being when it kept me safe when I highsided out of second place at the last round of Golden Era Superbikes at Cadwell Park last month, so I’ve had to retire it. The fit has always been perfect and I’ve been able to wear it for many hours at a time with no discomfort. There is excellent cooling and ventilation, and it’s very stable even at speeds of up to 180mph. What’s not: Sometimes the visor locking catch doesn’t engage properly and the visor can open at speed. However, this issue can be rectified free of charge by an Arai service centre or dealer.